Bola suiza para la fuerza, tono y postura libro. Escrito por Maureen Flett, un fisioterapeuta deportivo, y se ilustra con m-s de 300 fotograf-as a color, este libro ofrece una amplia gama de ejercicios para utilizar con su ejercicio de pelota FitBALL. Incluye la secci-n para las personas mayores. They're the ultimate in core training, the key to increased muscle isolation, improved balance, greater dexterity, and enhanced strength. Swiss balls--colorful balls that come in various sizes to suit different bodies and routines--are today's hottest workout trend, and here's the complete guide to the phenomenon. 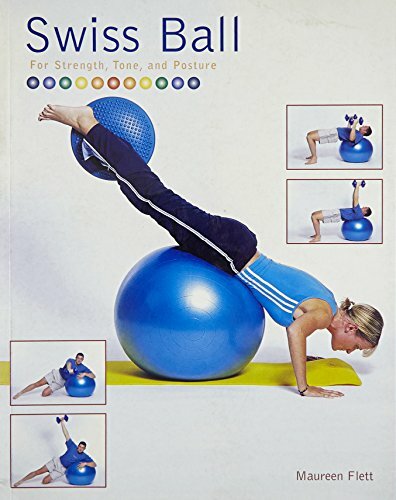 Packed with more than 300 color photos,Swiss Ball shows each routine from a variety of angles with concise captions that describe exactly how to perform each one for maximum results. General information covers choosing the right ball; gentle warm ups; and exercises for each area of the body, plus cardiovascular routines. Boost the effect of abdominal curls by doing them while gripping the ball with both legs. Or do a two-legged bridge with feet resting on the ball to tone the hamstrings, buttocks and lower back. The programs incorporate yoga and pilates to enhance mind/body awareness too. Once you've mastered the basics, try more advanced routines that use additional equipment such as weights and an elastic resistive band. You'll notice the difference immediately!